The FCC is about to vote on their seizure of the internet. There are five Commissioners, three dems and two ‘pubs. The new ruling was authored in the White House and handed to the democrat FCC Chairman Tom Wheeler to ram it through. The vote is expected to be along party lines. I first wrote about the nationalization of the internet earlier this month. The title of the Rule-Making is a lie. It’s not about internet neutrality. It’s about government control of the means, infrastructure and content of the internet. If it is passed, nothing good will come of it and internet access costs WILL go up. Did you hear that the DoJ had decided not to charge George Zimmerman in the Travon Martin case? The DoJ said there was insufficient evidence for any civil rights violation. What it meant was that the federal persecution of Zimmerman was finally over. Oh, the media did their part accusing Zimmerman of wife beating, girlfriend beating and of being a drunk. What they failed to tell you was that the two women admitted Zimmerman had done nothing. Their claims were lies. An article appeared in the American Thinker with some thoughts on the actions of the DoJ, none of them complimentary. “In all criminal prosecutions,” reads the Sixth Amendment to the U.S. Constitution, “the accused shall enjoy the right to a speedy and public trial.” In its dangling of George Zimmerman over the pit of judicial hell for the last three years, the Obama Department of Justice (DOJ) violated the spirit of that amendment for no better reason than to pacify the Democrats’ increasingly bloodthirsty base. Finally, on Tuesday of this week, the DOJ announced that it had found insufficient evidence to pursue federal criminal civil rights charges against Zimmerman. A White House so seemingly appalled by torture had no qualms about torturing Zimmerman needlessly for nearly three years. Indeed, within months of the February 26, 2012 shooting death of Trayvon Martin in Sanford, Florida, the DOJ knew it had no criminal case against Zimmerman, but it kept dangling him nonetheless. The article continues with an in-depth examination at the American Thinker website. 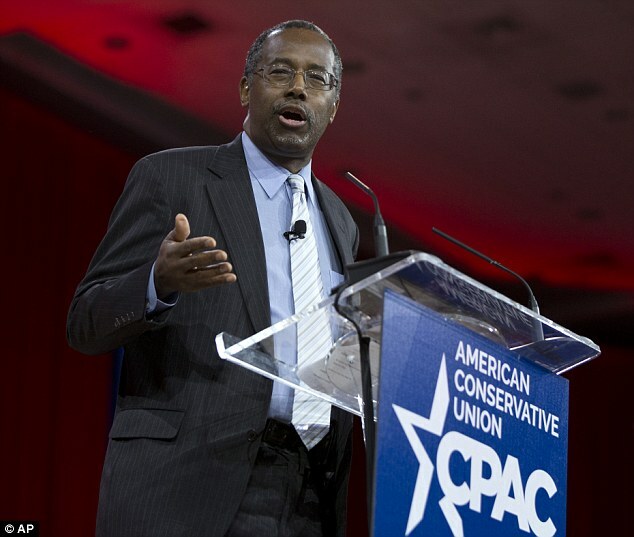 Dr. Ben Carson grabbed the Democratic Party’s third rail with both hands Thursday morning, launching a political attack based on his complaint that liberals are ‘making people dependent’ in majority-black American inner-cities. Race politics have been the near-exclusive domain of the Democrats since the civil-rights era of the 1960s, and Barack Obama’s successful White House bid in 2008 solidified their position. Scores of supporters chanting ‘Run, Ben Run!’ – almost exclusively white Americans – arrived with him. Matthew Brown, a New York college student attending the conference, told Daily Mail Online that Carson is just hitting his stride. Dr. Carson is a likable, charismatic speaker. He’s not afraid to attack the left’s sacred cows. I like much of his views…except for those of his concerning the 2nd Amendment and RKBA. He’s spoken about those views and they are soft…very soft. Still, he would be a better president than any democrat or RINO, i.e, Jeb Bush or Chris Christie. The Boston Marathon was bombed. The ones who set the bombs are either dead or in custody. That’s good. But the method used to find them? That’s another issue. From numerous reports, most of them still waiting for verification, Government, by this, I mean the state, local and the Federal government, suspended the Constitution in Boston. 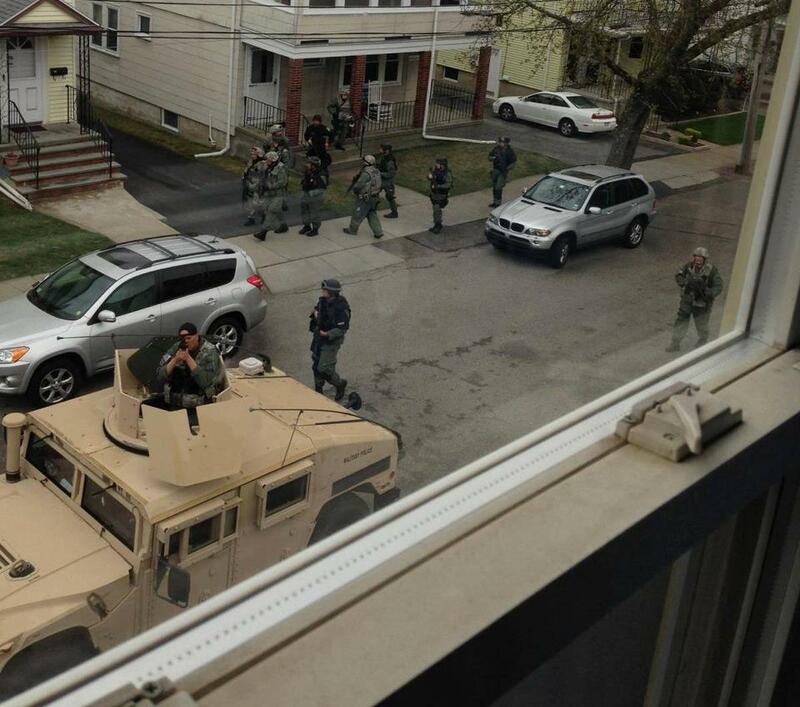 I don’t remember any declaration of martial law in Boston, but that is what, in effect, happened. The 1st and 4th Amendments were violated repeatedly. In some cases, even the media was treated like criminals (should I cheer?) being forced to the ground at gunpoint. For those of you with access to Facebook, you can view nearly 150 photos taken by individuals in Boston and Watertown. They are horrifying. How would you like to look out your window and see this pointed at you? This is what you can expect when the dems and liberals control government. When the search for Dorner was on in California, there was no lock-down until they had him located and then it was only for a few surrounding blocks. Boston was massive, massive over-reaction. And, Bostonians submissively accepted this. All the leftist are mourning—Sean Penn, Jimmy Cahtah, Iran’s Mahmoud Ahmadinejad, and Oliver Stone. Boo. Hoo. Expatriate Venezuelans, however, are celebrating. It is interesting to note that Chavez amassed an estate valued over $2 Billion. I don’t mourn Hugo Chavez. He was nothing more than an thug, a tinpot dictator who pillaged Venezuela’s economy. Hitler had his SS, SD and Gestapo. Stalin had his NKVD and KGB. Obama has his DHS. Let’s be frank. Bush was an idiot to create that department. Something had to be done to resolve the turf wars between the multiple intelligence and investigative agencies, particularly between the CIA and the FBI but the Department of Homeland Security was not the solution. There was a balance of power between the various competing agencies. With the DHS, that safeguard and balance of power, of “watchers watching watchers” is gone. Under Obama and the dems, the DHS and its subordinate, the TSA, has morphed—not evolved, but purposely redirected from protecting the US from outside threats to internals threats, real or fantasized. Why don’t we just call it what it is—Internal Security. Over the last few years, we have seen growing militarization of government. Local police departments everywhere now have or have access to paramilitary assault squads. Oh, they have fancy names like SWAT but the reality is that they are assault troops with the mindset of assault troops, not police. We are seeing more of that mindset in the federal government from the IRS issuing orders for weapons to the Department of Education who used their assault troops to invade a home for—overdue education loans! Now we see the DHS stockpiling ammunition and acquiring “surplus” armored Army vehicles—2700 armored troop carriers. The militarization and buildup of the DHS and other governmental agencies has drawn the notice of many in the conservative media…rational journalists who are not members of the tin-foil hat brigade. The leftist poo-poo the idea. Of course. Why Is Obama’s Growing DHS Army Buying Armored Vehicles? Security: In addition to stockpiling over a billion bullets and thousands of semiautomatic weapons the feds would deny U.S. citizens, the vehicle of choice for fighting the counterinsurgency war in Iraq is appearing on U.S. streets. The sequestration question du jour is why the Department of Homeland Security, busy releasing hundreds, if not thousands, of deportable and detained illegal aliens due to budget constraints, is buying several thousand Mine Resistant Armored Protection (MRAP) vehicles? And just who are they intended to be used against? This acquisition comes on top of the recent news of the stockpiling by DHS of more than 1.6 billion (with a ‘b’) bullets of various calibers, enough by one calculation to fight the equivalent of a 24-year Iraq War, and the ordering of some 7,000 5.56x45mm NATO “personal defense weapons” (PDW) — also known as “assault weapons” when owned by civilians. The Department of Homeland Security (through the U.S. Army Forces Command) recently retrofitted 2,717 of these MRAP vehicles for service on the streets of the U.S. They were formerly used for counterinsurgency in Iraq. These vehicles are specifically designed to resist mines and ambush attacks. They use bulletproof windows and are designed to withstand small-arms fire, including smaller-caliber rifles such as a .223 Remington. Does DHS expect a counterinsurgency here? After IEDs began to take a toll on U.S. military forces in Iraq, the Pentagon ordered a large supply of MRAPs. “They’ve taken hits, many, many hits that would have killed soldiers and marines in uparmored Humvees,” Adm. Michael Mullen, chairman of the Joint Chiefs of Staff, said in a recent interview. This is needed to serve warrants? Perhaps it might have been useful at Waco. So the question is what does DHS need 1.6 billion bullets, 7,000 Ar-15s and 2,700 armored vehicles for? What are they anticipating or planning for, and why are few in the media and Congress asking about it, particularly in the light of daily apocalyptic bleats from the administration about sequestration cuts? We have asked if this has anything to do with then-candidate Obama’s proposal for a national security force as powerful as the U.S. Army. No, we are not scanning the sky for black helicopters. But we are concerned about an administration pushing for ever stricter gun control and de facto gun registration in the form of allegedly universal background checks to which criminals and gangbangers won’t comply is arming itself to the teeth. If weapons of war don’t belong on the street, Mr. President, explain these purchases. Others are asking that same question and the run by citizens to acquire weapons and ammunition continues. Over the last few years I’ve posted numerous times about the death of media dinosaurs—here, here, and here. The Boston Globe is one such. It was up for sale some years ago and there were no takers. It’s owned by the parent company of the New York Times who is also on shaky ground. The NYT is putting the Boston Globe up for sale, again. (Reuters) – The New York Times Co is putting The Boston Globe on the auction block for a second time as it seeks to focuses solely on growing its flagship newspaper. The company said in a statement that it had hired Evercore Partners to advise on the sale, which also includes the Worcester Telegram & Gazette. The sale is expected to come at a big loss. Ken Doctor, an analyst with Outsell Research, estimated that the Globe could fetch about $150 million. The New York Times paid $1.1 billion for the newspaper in 1993. The New York Times is putting all its effort into being a global information source and “the Globe is a distraction,” Doctor said. Morningstar analyst Joscelyn MacKay said in recent years revenue at the Boston Globe had declined much more than at the New York Times. The New York Times first put the paper up for sale in 2009 as it struggled with losses. But it halted the sale process and decided to hang onto the paper after winning concessions from Globe’s unions and implementing cost cuts. Most print media organizations in the US, and in Europe, have umbilical cord ties to unions. The unions block modernization that would reduce production expense while demanding higher wages and benefits. The unions have been sucking the economic blood from their partners until, one by one, major metro newspapers are dying. Given the fact that newspapers have devolved into liberal propaganda tools, their passing is a good thing. The internet—and bloggers, are replacing them. And that, too, is a good thing. Illinois tyrants are trying to kill free speech in the state. Illinois state Senator Ira Silverstein wants to prohibit the use of “anonymous” comments on websites. Now on one hand, I can sympathize. Ninety percent or more anonymous postings are spam of one form or another. Another six or seven percent are vitriol by opponents of the post or of the author and use “anonymous” to hide their identities. I’ve had a few of those on my website as well. The remaining percentages are those who don’t have an internet identity they wish to publicize. It is the last two catagories above that involve free speech. As much as I hate the rants spewed by liberals directed to my site by the Democrat Underground or the Daily Koz, they do have a right to say their message—just as I, as a website owner, have to right to remove their posts when they exceed the bounds of propriety. Silverstein wants the state to enforce those prohibitions. Why? The site owner may approve of the statements and if/when those same statements offend Silverstein or his liberal buds, he has no recourse to force the removal of those statements. His bill would grant him that authority regardless whether the website owners agree or disagree with Silverstein’s demands. It’s nothing more than another liberal attempt to stifle free speech. A recently introduced bill in the Illinois state Senate would require anonymous website comment posters to reveal their identities if they want to keep their comments online. The bill, which does not ask for or clarify requirements from entities requesting the comment removal, would take effect 90 days after becoming law. Pseudonymous and anonymous comments have long been a critical part of U.S. public discourse, though, and the bill may be on shaky legal ground. “Thus in 2002 the Supreme Court struck down a law requiring proselytizers to register their true names with the mayor’s office before going door-to-door,” wrote EFF, noting that the Supreme Court protects Internet commentary as it does pamphleteering. The bill is part of a larger trend of lawmakers seeking to censor anonymous online speech. Of course we must realize this is Illinois. New York tried to pass a similar bill last year by establishment ‘Pubs. They failed. This last item needs no added comments. It speaks for itself. New Yorkers, the British are coming. Where is your militia? New York prosecutors will pursue felony criminal charges against retired special forces soldier Nathan Haddad, who was arrested in LeRay, New York in January for allegedly possessing five 30-round AR-15 magazines, according to conservative law blog Legal Insurrection. Prosecutors had reportedly offered Haddad a plea bargain that would spare him jail time if he admitted to five misdemeanors, according to Legal Insurrection. But Haddad’s attorney told the blog that Haddad, who currently works at the Department of Defense, will not accept the deal. It is unclear how Haddad was arrested or discovered with the magazines. Haddad was deployed four times during his ten-year Army career, and was once injured during special forces training in South Korea. He was discharged in October 2010. A website established to pay Haddad’s legal expenses has collected more than $35,000. Oh!, I’m not stopping my blog. It’s the last post of the year, 2012. It’s New Years Eve. Snow is falling lightly outside. The temperature is hovering at freezing and the forecast calls for more snow throughout the day and into tomorrow. My wife ran some last minutes errands this morning and we’re set for whatever may come—snow, ice or blizzard. Every year I promise to get an emergency generator and every year I don’t. I just hate to spend money on something that I may never use. I keep reminding myself it’s like insurance and I always forget. We’d need at least a 5KW generator at minimum. Then add the wiring necessary to have it perform properly and venting for the exhaust when it does. Not cheap. And, I’m cheap; a holdover from my Depression Era parents and grandparents. Truthfully, I’m not concerned about the weather. I have a strong tendency towards Cabin Fever. Before, if I started getting jumpy, I’d just get in the Tahoe and go somewhere…anywhere. The “where” didn’t matter. That’s not a real option at the moment. Saturday, the Tahoe’s transmission started slipping between gear shifts. Manual shifting appears to work but I’d rather not push it. I’ve phoned for an appointment at my friendly auto mechanic. He’ll return my call Wednesday, I expect. I could drive my wife’s car, a rollerskate, in an emergency but I’d need a shoehorn to get in and help to get out. Not a viable option. So I’ll sit here, waiting for Wednesday and a callback. The crazies come out at the end of every year. There were some examples in my American Thinker newsletter this week. It is as inevitable as the rising of the sun; the Left, when thwarted in their quest for power, suggests the use of lethal force to compel those who disagree. There is a nauseating litany of murders done by our betters in their pursuit of the Benthamite vision of “the greatest good for the most people” — which in their minds equates to collectivization and socialism. You have Lenin, Stalin, Hitler, Margaret Sanger, Mao Tse Tung, Pol Pot. Now we can add one more name to the list: Professor Richard Parncutt, Musicologist at Graz University in Austria. Parncutt has issued — and later retracted after it the public outcry — a manifesto calling for the execution of prominent “Climate Change Deniers”. What is interesting is that Parncutt hates the death penalty and supports Amnesty International’s efforts to end it. This would be a shocking thing for a college professor to do were it an isolated incident, but this call has been made a number of times in the past. For instance, an anonymous poster at the liberal website Talking Points Memo called for similar action, as did Climate Progress editor Joe Romm, who called for “deniers” to be strangled in their beds. Grist magazine writer David Roberts called for Nuremberg trials for “deniers” and NASA’s James Hansen has likewise called for similar trials. A common denominator of this kill-crazy proclamations is that they all are made by public employees…state-supported academics and government employees. They all hide behind their tenure, unions, government employee regulations that makes it nearly impossible to fire them; as long as they don’t embarrass their boss…too much. You see, their bosses agree. That’s the real issue. Imagine the uproar if we declared the same for anyone supporting unproven pseudo-science as do these wackos? Every once in a while an article appears that really invokes thought. This is such one. The title attracted me and then I read more. It’s really true that fiction is more often accurate than reality. Every once in a while we try to escape to one of those rare, childlike, stay-in-your-pajama’s, popcorn-munching days when we can block out the fear of a collapsing economy and hide from a repulsive culture that seems to embrace everything that is bad. Lately it just doesn’t work. Settling in for an original “Star Trek” TV series episode called “A Piece of the Action,” I was shocked as it seemed more like a mocking commentary on our current crises. Searching for a space vessel lost 100 years earlier, the crew of the USS Enterprise arrives on the planet Sigma Iotia II. The planet has been “contaminated” after salvaging a book from the lost vessel called Chicago Mobs of the Twenties; a book they now venerate and base their civilization on. Conventional government had broken down and society was now a tumult of mob bosses, crime, death, and revenge; it could operate no other way. One can’t help but think what an appropriate Rahm Emmanuel/Barack Obama scenario it was; similar to when Saul Alinsky’s Rules for Radicals contaminated our own civilization. It’s a long article but I urge you to follow the link and read the entire column. The parallels draw in it are astounding, amazing and incredibly accurate. Y’all have a great New Years! Make sure you survive it. So many things have appeared today. Hobby Lobby told Obama to pound sand on their contraception mandate. 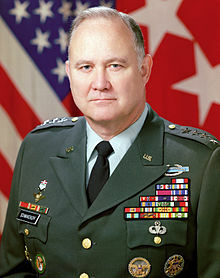 General Norman Schwarzkopf died (how did he get to be 78!?). Hypocrite Diane Feinstein, who possessed a concealed carry permit…lapsed she now says, wants to ban semi-automatic weapons and place the existing ones under the 1934 NFA act and require them and their owners to be registered—plus pay a federal tax. Finally, a story appears on the CNBC website that suggests that millionaires on death’s door be given a push to spare their heirs the higher inheritance tax that arrives next week with the new year. The leftists plan at nibbling away our rights under the Constitution is working. With Justice Roberts betrayal last summer on Obamacare, we no longer have a conservative majority on the Court. If this latest gun-grabbing scheme fails in the House, Obama will use his regulatory “powers” to enforce some provisions of Feinstein’s plan. Of course, the leftists know that gun control isn’t about curbing crime. Chicago has had the nation’s strongest gun control laws for decades. As this story shows, gun control doesn’t stop children from being killed. The cesspool known as Chicago probably has the toughest gun laws in the country, yet despite all the shootings, murders, and bloodshed, you never hear a peep about this from the corrupt state run media. In Chicago, there have been 446 school age children shot in leftist utopia run by Rahm Emanuel and that produced Obama, Jesse Jackson, Louis Farrakhan, etc. 62 school aged children have actually been killed by crazed nuts in Chicago so far this year with almost two weeks to go. So why isn’t this news worthy? Is it because it would embarrass those anti second amendment nuts who brag about Chicago’s tough gun laws? Is it because most of the kids who were shot and killed were minorities? Or is it because the corrupt media doesn’t want to show Chicago in a bad light? Amazingly, no Obama crocodile tears either. For those of you too dense to get the point of this post, it’s to make the point about gun laws. No matter how tough the gun laws are, the crazed, nut jobs will find a way to get them and if they so chose, use them. No draconian law can stop this, no matter how well intentioned the law is, or if it’s just about leftists grabbing power from citizens and taking away their constitutional rights. If any of Feinstein’s proposal is passed, or if Obama ignores Congress again and issues another edict, I expect many across the country will follow Hobby Lobby’s lead and just ignore the law. I wonder how many FFLs will have unexpected fires in their 4473 archives? We know Obama, now that he’s won his second term, has no restraints. He’s told us so. More and more, I wonder if the country can survive these next few years without another civil war.